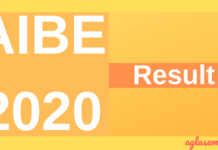 The result for AIBE 2019 has been announced on March 15, 2019. The AIBE Result 2019 is announced online at allindiabarexamination.com. The Bar Council of India (BCI) conducted the All India Bar Examination (AIBE) XIII on December 23, 2018. AIBE XIII / 13 is the thirteenth All India Bar Examination which is being conducted by BCI for Advocates or LLB degree holders enrolled with a State Bar Council to get Certificate of Practice. This is because an advocate is allowed to practice law when he/she has a valid Certificate of Practice. Get here complete details of AIBE 2019 / AIBE 13 such as exam date, syllabus, registration, admit card, result. Latest: AIBE XIII Rechecking result has been announced. Click here to check the same. All India Bar Examination (AIBE) 2019 dates for registration, fee payment, admit card download, exam date, result declaration can be checked from the table below as per announcement of BCI. Candidates must focus on preparation for the exam until then. Read on to know all about the exam on this page. BCI declared AIBE (13) 2019 Result in online mode. To check the result, the candidates need to log in by entering their Roll Number as provided in their AIBE 2019 Admit Card, and Date of Birth as submitted at the time of registration. Through AIBE Result 2019, the candidates get to know status that is whether they have qualified to get Certificate of Practice of not. Highlights of AIBE 2019 Result are as follows. Result of All India Bar Examination contains name, father’s/husband’s name, roll number, registration number, enrollment number, result status. BCI issues Certificate of Practice (COP) soon after AIBE Result. However, it is a standard norm to do practice on the basis of the result in the interim period. Candidates must obtain cut off marks in order to qualify. Those who get qualifying cut off marks are declared as Qualified and they then get Certificate of Practice. Cut Off Marks: 40% (40 out of 100). [email protected], within the next 10 working days, i.e, Jan 10, 2019, till 5:00 PM, after which no claim will be entertained whatsoever, and results will be declared based on the Answer keys as uploaded. 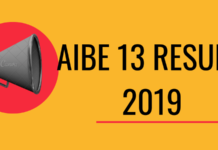 Click Here to check AIBE XIII 2019 revised Answer Key. 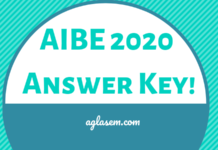 Click Here to check AIBE XIII 2019 Answer Key. Click here to check the List of candidates whose set code is missing for AIBE – III. Note: As per the decision of monitoring committee two Questions have been rejected. Marking is done on 98 marks (Total). Passing % was fixed at 40% Category for GENERAL/OBC and 35% for SC/ST. Candidate scoring 39 marks and above of GENERAL/OBC have been declared “PASS”. Candidate scoring 34 marks and above for SC/ST Category have been declared “PASS” Kindly Click Here for Revised & Approved Answer Key AIBE-XIII”. Candidates who successfully submitted their Application form for AIBE 13 2019 can now download AIBE 2019 Admit Card. It is compulsory to take it to exam hall on the day of the exam. Important things to know about admit card download are as follows. AIBE (13) 2019 Admit Card is to be downloaded at allindiabarexamination.com. Candidates can download it as per schedule only. Candidates must print officially issued admit card and keep it safely for exam and future reference. First thing that candidates want to know is exam date of AIBE 2019. In that regard, it is informed that exam date shall be notified publicly through a BCI announcement. Until then, take a look at past year exam dates of All India Bar Examination to get an idea of its frequency. Eligible advocates must register for All India Bar Examination (AIBE 13) as per schedule above. Key details regarding AIBE 2019 registration are explained below. Candidates can start online registration as per schedule at allindiabarexamination.com. Fill and submit correct details in online form and upload photograph, signature, enrolment certificate. Self attest all documents. SC/ST category candidates must also upload category certificate. There is no need to send to send any document by post. Candidates should pay requisite application fee in mode prescribed by BCI only. If fee remains same as last year then application fee for SC/ST is Rs 2560, and for General/OBC it is Rs 3560. By last date of application form filling, registration should be done and submitted. By the same token, by last date for fee payment, applicants must pay fee. If there is any incomplete form, then candidates must submit it by last date pertaining to it. Keep a print out of AIBE 2019 Application Form with you for future reference. How To Fill And Submit AIBE 2019 Application Form? Future lawyers must apply online on time. To make their process easy, step by step guide to fill form is given below. Now, these are steps to apply. Enter name, gender, father/husband’s name, date of birth, address. Upon submitting these details, check email for registration number and password. Then go to allindiabarexamination.com and click “Login Here for AIBE XIII”. Use registration ID and password to login. Take challan and requisite fee amount to the necessary bank branch. Pay fee. Login after 24 hours of paying fee. Upload challan. Now take a printout of AIBE 2019 Application Form. Syllabus of AIBE usually remains the same every year. So even before the declaration of AIBE (13) 2019 details, candidates can start preparing for it on basis of last year syllabus. 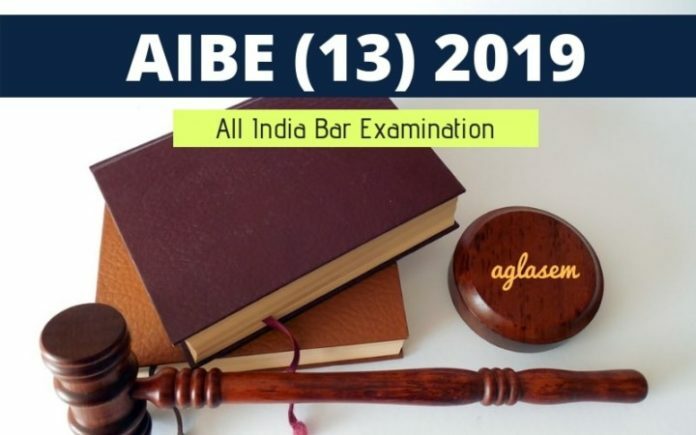 AIBE 2019 Syllabus is based on syllabi prescribed by Bar Council of India (BCI) for 3 year and 5 year LLB programs. Check it here below. All India Bar Examination is an open book examination. This means that candidates can take books, bare acts, any book for exam. First, check distribution of questions above. Then read on to know more about exam pattern. Disclaimer: BCI officially only releases syllabus with every AIBE exam. However there is not much info otherwise on exam pattern. Based on some old documents, which were initially released when AIBE was introduced, following exam pattern is explained below. If you have any better information in this regard, please feel free to correct us in comments below. Duration: 3 hours 30 minutes. PWD candidates get 20 minutes extra per hour. Medium: English, Hindi, and 9 other languages. Marking scheme: 1 mark for correct answer. If you have decided to appear in AIBE 13, then you should start your preparation today. Although it is an open book exam, even then, better knowledge will help you sail through the exam. Foundational – These questions form basis of large areas of law. Other subjects – Which a new entrant to legal profession should also have basic idea of. Candidates must understand their topics rather than try to just memorize them. If you do this, then on day of exam, you won’t have to keep flipping thick books to find answer. You can then directly go to required chapter or page. Read complete question and understand it first. Correct answer will be one that answers question most directly and is based closely on principle of law provided. Be good with time management. If you spend too much time on questions that you cannot do initially, then you will lose out that precious time later on questions you can do. So judge first which questions to attempt, do them first, secure marks, then move on to time consuming questions. Know your weaknesses and try to convert them to strengths in weeks before exam. Here are some frequently asked questions on AIBE, and their answers. Qs. 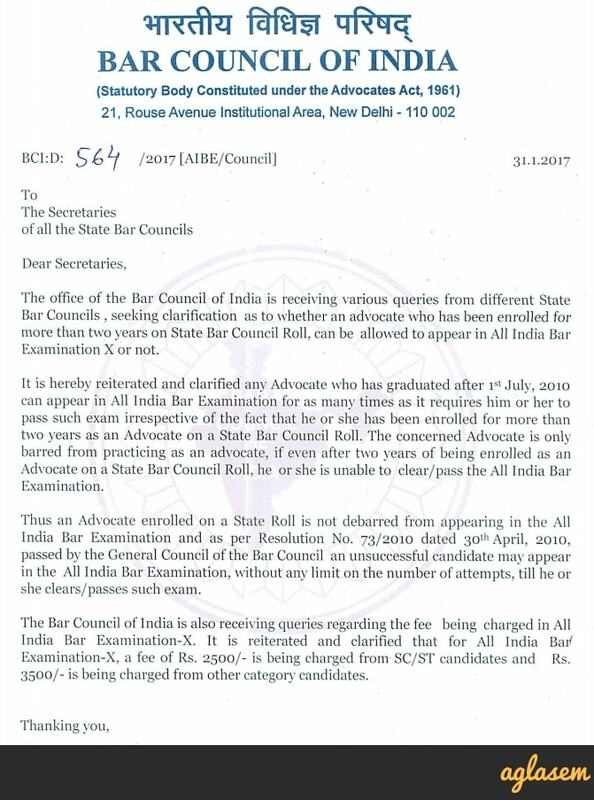 Will an advocate, who has been enrolled for more than 2 years on State Bar Council roll be allowed to appear in AIBE or not? Ans. In response to this query in previous exams, BCI issued this notice. See image below. Qs. Are scores or ranks released with AIBE Result? Ans. No. AIBE result only shows pass or fail. Score / percentage / percentile / rank is not shown. Candidates can get here AIBE previous year question paper in pdf format for practice. Solving AIBE previous year question papers is probably the easiest way to get to know everything about an exam. By practicing previous year question paper candidates get to know about the number of questions, exam pattern followed, maximum marks and time allotted. Best of luck for AIBE 2019! Official website of All India Bar Examination is allindiabarexamination.com.